May want to look at the stem in the picture from Sep. 8th… looks like you may have had a squash bug problem. Although it is hard to see frass, it looks like there may have been a hole in the stem from them. Powdery mildew is a common issue. Avoid evening waterings.. and a baking soda and water mixture in a spray bottle to spritz the leaves when you see the very first few specks show up. (The baking soda mixture tweaks the pH a bit- making it more alkaline, which messes with the powdery mildew.. which prefers a bit more acidic conditions.) Carefully remove leaves.. and watch water splashing.. those white spots of PM release spores and it can move really fast. Most acorn strains are hybrids. 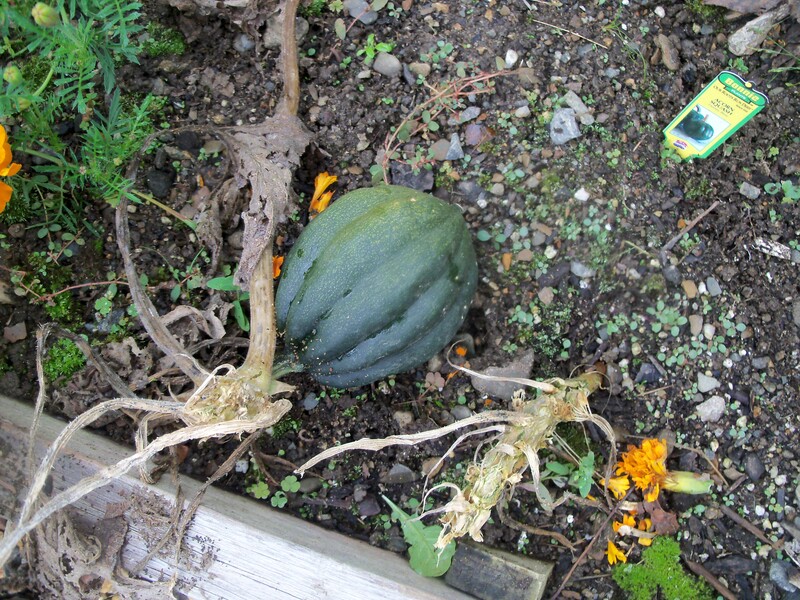 They are in the species Cucurbita pepo.. same as zucchini and a ton of other typical squash. Just a heads up on that if you get into saving seeds, It gets tricky with C. pepo when you try to avoid outcrossings. Anne, Thanks so much! I will check that out and the baking soda spray will be in our arsenal next year! Thanks for visiting our little Patch!! No problem. Love squash.. especially acorn. Just with the baking soda mixture only do a little bit into a spray bottle (like 1 teaspoon per quart.. better to have it too mild than too strong!) Some use watered down milk.. does the same basic thing, but that seems like a waste of milk .. to me anyways. Here’s to hoping for a great garden next year too!